Apple glazed over one of the coolest things it announced today by failing to mention it at all during its iPad Air 2, iPad mini 3 and Retina iMac keynote. In fact this breakthrough isn't even featured on Apple's main iPad Air 2 hub; you have to click through to the "wireless" page just to see it. But when you do, you'll learn that Apple is launching a new "Apple SIM" that is more versatile than any SIM we've seen before. 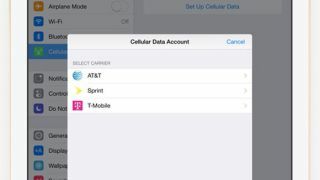 According to Apple, it lets users choose from a number of different short-term wireless plans from select US and UK carriers - and you do it right from the iPad. "So whenever you need it, you can choose the plan that works best for you - with no long-term commitments," the site says. Plus you can potentially choose short-term data plans from carriers in other countries when you travel. The Apple SIM comes preinstalled with every iPad Air 2 that has cellular capabilities. Participating carriers include AT&T, Sprint, T-Mobile, and EE in the UK, but hopefully more get on board soon. It is a bit odd that Apple is debuting this awesome new capability in the iPad instead of the iPhone 6 or iPhone 6 Plus, which launched in September, but no doubt Apple has its reasons. While you're here, why not check out our iPad Air 2 hands on video!